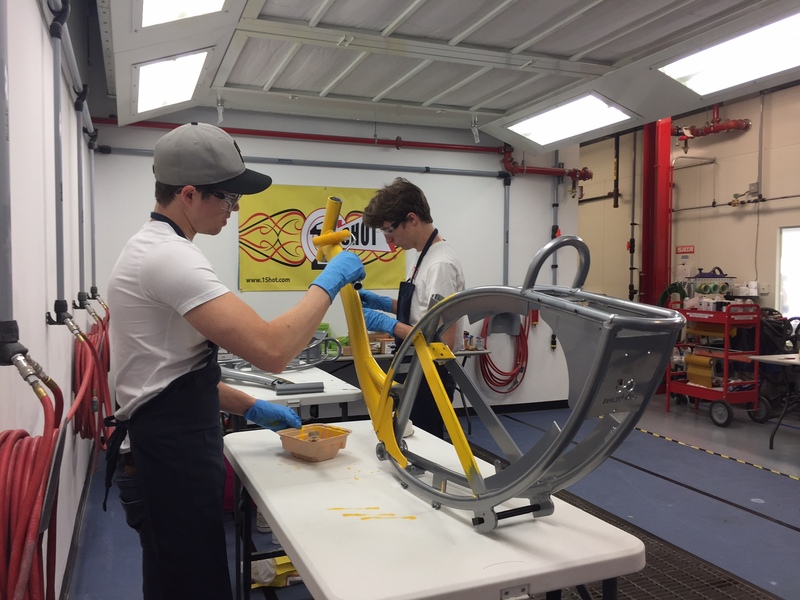 On July 15 2017, Healthy Ride, in partnership with PPG Paints and the Pittsburgh Downtown Partnership, launched five unique bikes into the existing fleet of 500 bicycles. These five bikes are special, each one designed by a local artist who hand-crafted and designed their bicycle. 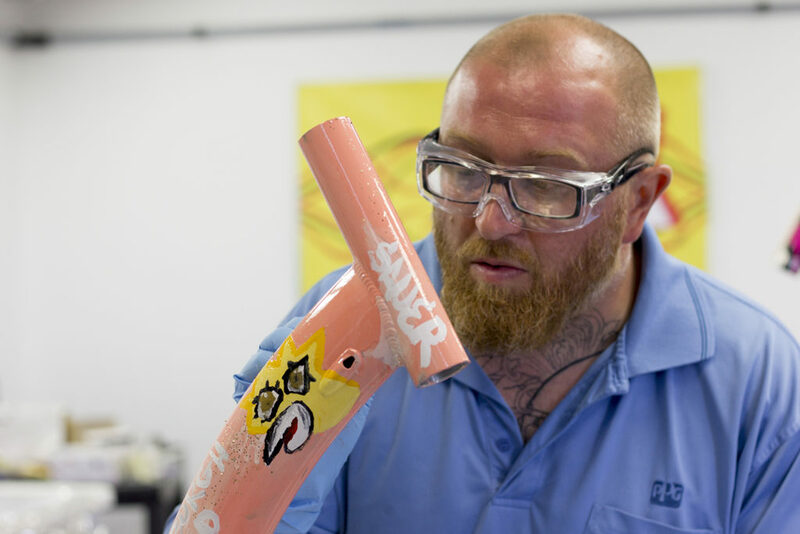 The #BurghBikes Unicorn Bike Project celebrates Pittsburgh by bringing mobile public art to its streets and engaging the local art community in an effort to further beautify Pittsburgh neighborhoods. PPG Paints donated not only the 1Shot! 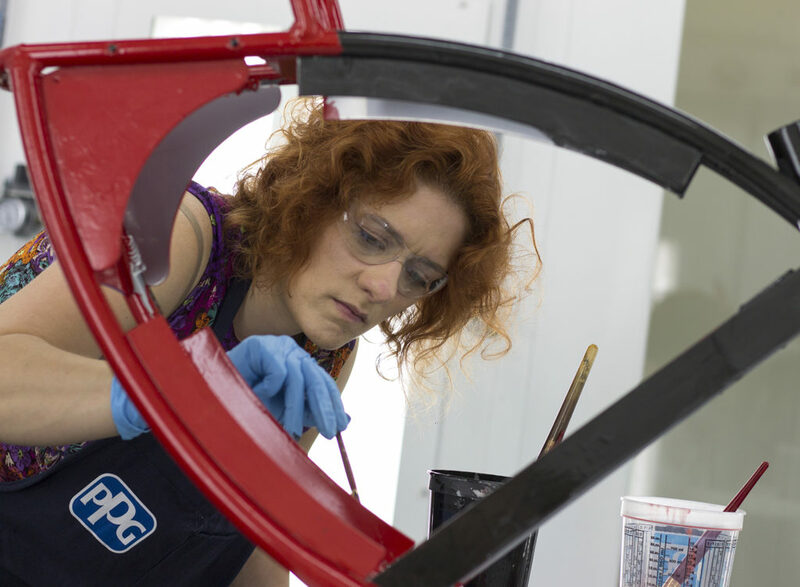 paint to professionally create each design, but also their training facility and staff to help make each work of art a reality. The #BurghBikes fleet launched at the Pittsburgh Downtown Partnership’s Night Market providing the first look at each bicycle before they were released into the wild. Lizzie finds inspiration in everyday little random things. And she means everything. Lizzie is constantly painting tiny paintings in her head all day long. Her physical art tends to become unpredictable, whimsical, or even unusual like a wandering journey. She believes talent is irrelevant in creating art and the thirst to bend boundaries of paint and being able to experiment with tools and her mind makes life and creating very exciting. Lori is a visual artist working with photography in light painting using LEDs in performative gestures that retrace movements across landscapes from memory. She recently founded River Route, an exploratory artist and adventurer residency program, with a fall weekend hike planned for late September. A desire to experience places that will be changing over the course of her lifetime has drawn her outdoors with a recent focus on the Arctic. Lori lives in Pittsburgh and is associate professor of integrative arts at Penn State Greater Allegheny, is board chair at Silver Eye Center for Photography, and exhibits her work internationally. Jay is a graphic designer based out of Pittsburgh, PA. He spends his days creating pieces such as advertisements and billboards that can be seen throughout the city. Outside of his love for design, Jay enjoys being a superhero fanatic, playing his guitars, and watching movies with his wife and friends from the VIP section of Loews Theater at the Waterfront. One of the reasons I love Pittsburgh is because the layout of the city offers residents the ability to cross throughout town easily. I was drawn to the Healthy Ride program because of its initiative to keep other Pittsburghers on the move and its promotion of an activity that is affordable and accessible to all. Jason creates art from objects sourced from his environment and uses the art to create dialogue with in his community. From PPG Paint & Alcoa Metal for paintings to smashing cars in the demolition derby as performance art, Jason Sauer shows the power of rebirth with an emphasis on telling stories that reflect the universal connection of longing for home. Sauer is a 6-year army vet who received 2 medals during his service and was honored as a 40 under 40 by Pittsburgh Magazine. Goodwill of Western PA has recognized Sauer for his work with young men recently released from prison with the “Power of Work Award”. Jason has a Master of Fine Arts from Marywood University as well as a Bachelor of Fine Arts from Edinboro University. A large part of what I do focuses on public art and making art accessible to all through custom vehicles such as art cars and demolition derby trucks. The idea of the Unicorn Bike Project really connected things I love together. Public art, custom modes of transportation, and PPG Paint! Many artists create art to mimic and reproduce the world that they see in order to depict and share the subject of the art with the audience, but other artists create things that they have imagined to express their own thoughts and personality. This is why Peter makes art. When creating art, he strays away from making a replica of life, opting for creating fictional embellishment of reality or fantasies from his own imagination. Many of Zurawsky’s pieces start out with no prior structure or plan. Instead, he simply starts working and finding out where his hands take him, which is the best way for him to truly express his inner thoughts and feelings. To me, the ability to express completely new and original ideas is the most pleasing part of art to me.